In the weeks leading up to Saturday 24 July 1903 a large number of colourful posters appeared in Yeovil advertising the forthcoming visit of Buffalo Bill's Wild West Show during its two-year tour of Britain and Europe. William Frederick "Buffalo Bill" Cody (1846-1917) was an American scout, bison hunter, and showman. Cody's early life symbolised the history of the American West. At the age of fifteen he worked as a rider for the Pony Express and in 1864 enlisted in the Seventh Kansas Volunteer Cavalry. He was then employed as a scout for General William Sherman before working under contract for the Kansas Pacific Railroad as a buffalo hunter in 1867-68. According to his autobiography in the two years that he worked for the company he killed 4,280 buffaloes and acquired the name Buffalo Bill. In 1868 he returned to the U.S. Army as chief of the Scouts for the Fifth Cavalry. When Buffalo Billy Cody came on the first on his three visits to the United Kingdom in April 1887, the furore he created was unprecedented. Thousands lined the streets when the exhibition made its way to Earl's Court and on its opening night 28,000 people were there to see the splendour that was Colonel Cody's Wild West. 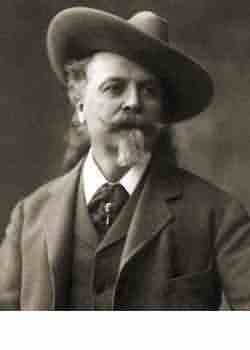 Buffalo Bill would return again in 1891-2 and finally from 1902 to 1904. Scenes from his Wild West included reenactments of frontier experiences including battles between Indians and the cavalry. Indian men, women, and children posed near tepees in front of painted backgrounds of mountains and other outdoor scenes. To say that the show was large is something of an understatement - when it detrained at Hendford Station in the early hours of Saturday 24 July 1903 it included over 700 people and 400 horses. The showground was set up in a large field called Yarn Barton to the immediate west of today's Horsey Lane and the immediate north of Hendford Station. A canvassed area surrounded the large open space in which the show took place, measuring 325 feet by 500 feet (100m x 150m), and seating was provided for 15,000 people. It was estimated that some 9,000 people came from far and wide to watch the afternoon performance and 15,000 more enjoyed the evening performance that was illuminated by electric lights. The Western Gazette's complete report of Buffalo Bill's Wild West Show's visit to Yeovil is reproduced below. 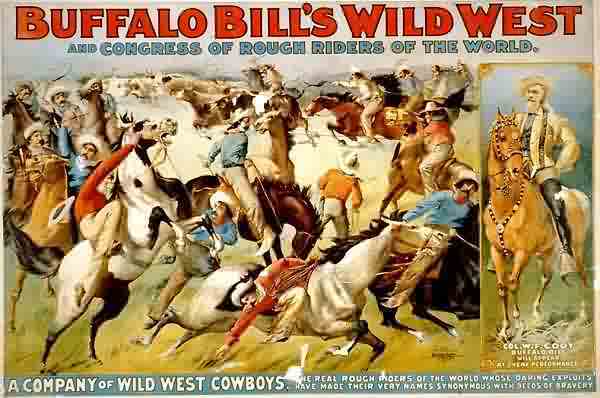 One of the many posters that appeared in Yeovil in advance of Buffalo Bill's Wild West Show held in a field off Horsey Lane. Although not Yeovil, this photograph shows the set-up of the Wild West Show's arena. 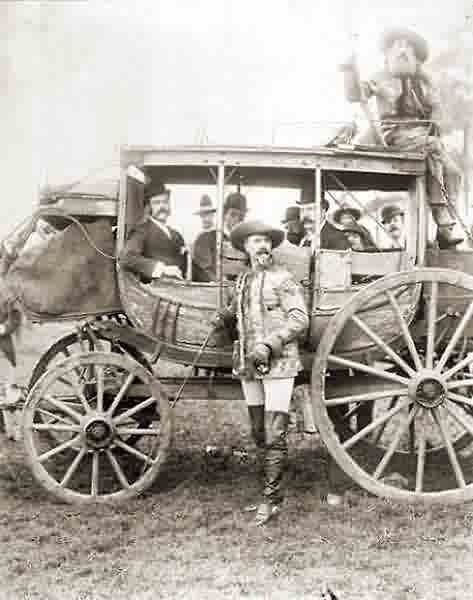 William F "Buffalo Bill" Cody poses by the door of a stage coach used in the show. The full report of the show from the Western Gazette.